Democrat, Cameron, Lincoln, and Bross– a.k.a. Decalibron, at least to those who obsess over 14ers here in Colorado. Peakbaggers love the easy Decalibron loop, allowing for four 14,000 foot summits to be tagged from the trailhead at Kite Lake, outside of Alma. The Google Earth map of the day. Staring at Kite Lake we first went up to Democrat, and then headed clockwise. Click to enlarge. Nowhere else in the state can you summit three official 14ers (and one unofficial one, Cameron) so easily. Even if you like more challenging routes, harder days, etc., it’s really pretty cool to be able to link up these peaks so easily and cruise fairly good trails up high. 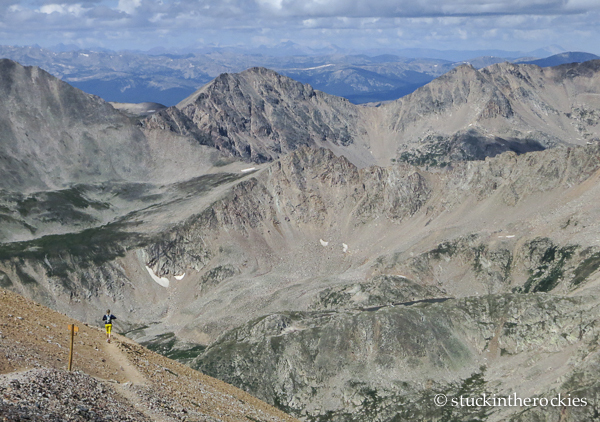 The fact that the starting elevation at the Kite Lake Trailhead is 12,000 feet, and that it’s very accessible from Denver and the Front Range only make it more popular. Topping out on Democrat. The ridge to Cameron and Cameron’s flat summit can be seen in the distance. And it’s actually quite runnable, too. So Christy and I figured we would pay it a visit. 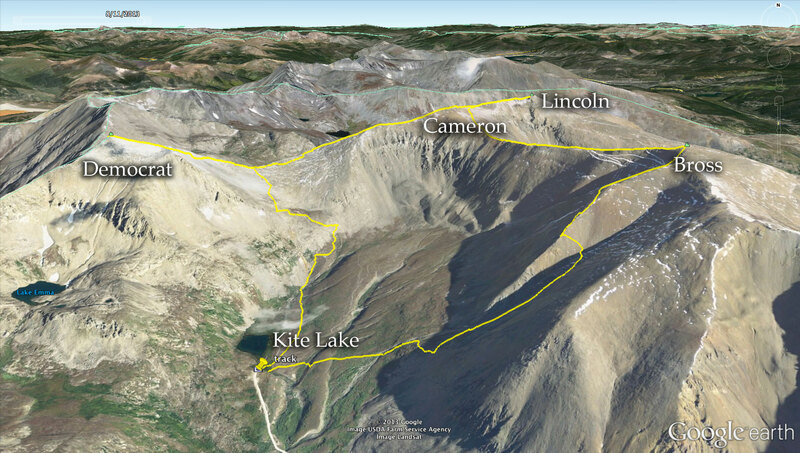 From the Kite Lake Trailhead, start up the well-traveled route to the summit of Mount Democrat, 14,148 feet. This is the biggest challenge of the day for a few reasons: the majority of the climbing is done on this leg (2150 feet of about 3400 total), it’s a bit steep and loose for a jog-pace in parts, and it’s almost always busy with people. Coming off Democrat. Kinda busy up there. On the ridge to Cameron, after summiting Democrat. The switchbacks up Democrat can be seen. Once at the summit though, everything becomes more cruisey and fun. Descend the trail you climbed to the saddle with Mount Cameron, and then follow the ridge to Cameron’s summit. 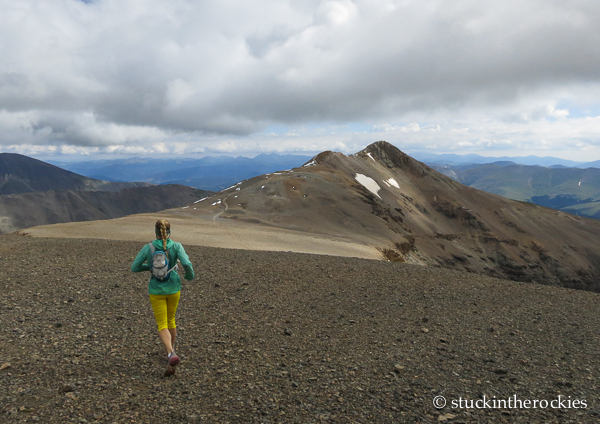 Despite being tall, at 14,238 ft. Cameron isn’t an official 14er. Neighboring Mount Lincoln is taller, and the saddle between the two doesn’t drop enough to classify Cameron as its own summit. Technically speaking, it’s a sub-summit or shoulder of Lincoln. Interesting though, were it only 49 feet higher, it would be the tallest in the group and Lincoln would be the one bumped off the list. From Cameron’s flat summit, an easy jaunt leads to Lincoln, out ahead in photo. Coming off Lincoln. Quandary Peak can be seen in the shadow in the distance. 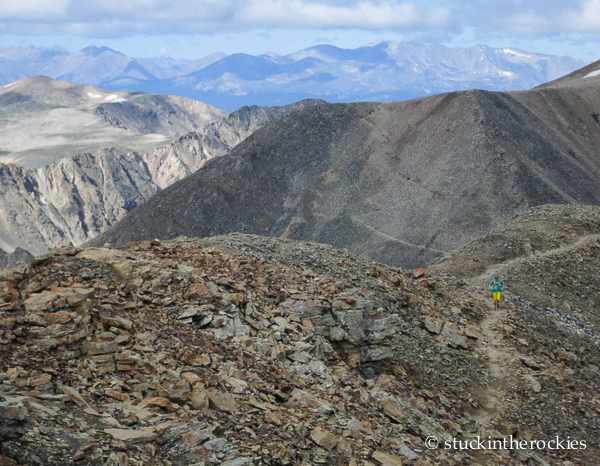 Drop down to the shallow saddle between the two and make the short trip to Lincoln’s summit, at 14,286 ft. Head back towards Cameron and follow an obvious trail that forks towards Mount Bross and tag summit #4 of the day. Like Lincoln, it’s a short effort to Bross’s flat summit, and from there head north down the semi-steep trail back to Kite Lake. 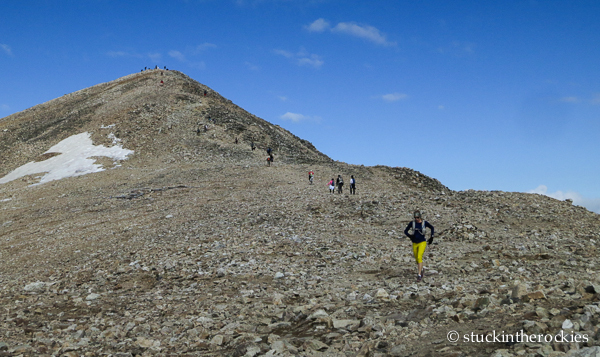 The stats came in at 7.19 miles, with 3,440 vertical feet gained and lost, in 2:52. Neither Christy nor I felt we were pushing it too hard and if you’re good at moving quickly, 3 hours is entirely reasonable. Go for it. A panorama of the route as Christy descends Bross (left in photo). Democrat is center, Cameron is right, and Lincoln is far right. Click to enlarge. Ellingwood’s solo effort in late August day in 1921, the first reported ascent of the ridge that now bears his name, was way ahead of its time. Last weekend, Christy, Dirk and I followed in his footsteps, and despite the passing of ninety years, it seemed as though not much has changed. 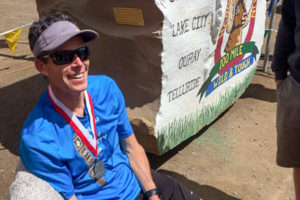 Any finish at the Hardrock 100 should be considered a great achievement. There are so many ways to come up short on the burly course that anyone who makes it all the way back to Silverton deserves to be commended. Easy tickmarks off the 14’er list.Curious though Ted,on the 14’er ski list,do you and Christy do the close peaks the same way,or do you have to go up and down each peak separately?Also what was the easiest peak to ski down,Sherman or Humbold maybe?,and how much skill at skiing does that peak take? Easy ticks for sure. We always skied the peaks individually. Lincoln, Democrat, and Bross were all done on separate days. I think it’s up to the individual, but we prefer to actually ski down from a summit and not claim them as “skied” through some ridge traverse. Just our opinion. There aren’t any real “rules” in place, so long as you ski from the summit. But even that’s flexible (Wetterhorn). 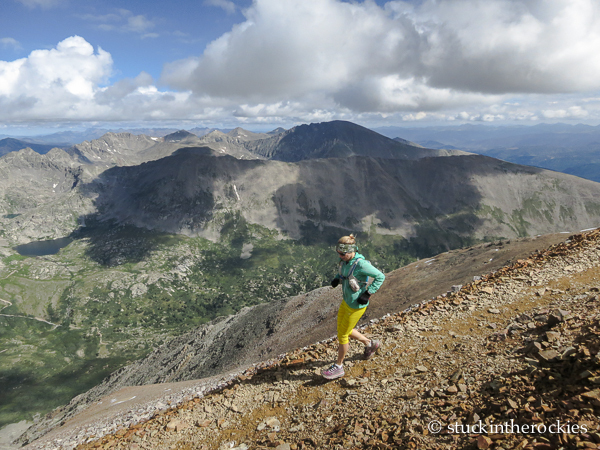 The easiest peaks weren’t always the easiest summer hikes. 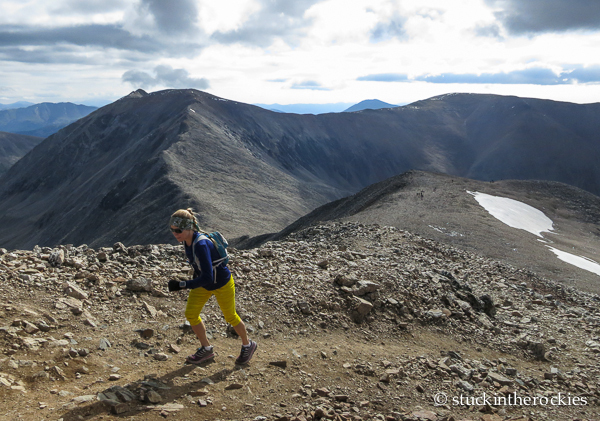 The Summit/Leadville area can have tough, wind-blasted snow and be really cold and windy. Some of those days were hard, or at least unpleasant. It’s really all in the day. 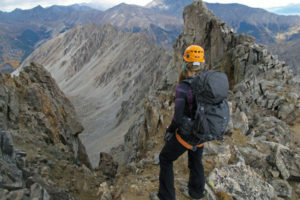 Find a nice calm May day with good corn and a steep peak like Sneffels can feel easy. Lousy snow and changing weather can turn Elbert into an epic. In our case, I think Missouri, Harvard, Bierstadt, Grays and Torreys, Redcloud, Sunshine, Handies stand out as fun and easy (in a straightforward sense). Humboldt we did right from Crestone Needle, so it was easy skiing, but part of a longer day and didn’t feel as easy as it would seem. Overnights in the Sangres are always hard with the approach and camping gear. I bet if you asked lou dawson or someone else, their list would be all different. 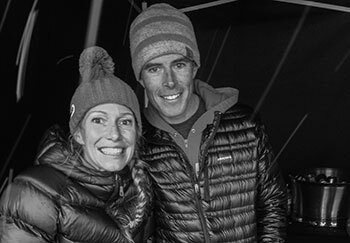 It’s all in the day, same as it is often with the long races, right?